India wants to better understand Washington’s concerns over its ongoing procurement of Russian military hardware. India is expected to dispatch a high-level delegation that will include senior Indian defense officials to Washington in the coming weeks to better understand U.S. concerns over Indian purchases of Russian military hardware, according to local media reports. The trip is reportedly scheduled to take place ahead of the twice postponed India-U.S. “two-plus-two” ministerial dialogue between Indian Foreign Minister Sushma Swaraj and Defense Minister Nirmala Sitharaman and their U.S. counterparts, Mike Pompeo and James Mattis. The two-plus-two meeting is now scheduled to take place in September in New Delhi. Neither the Indian nor the U.S. government has publicly confirmed the Indian delegation’s possible visit to Washington. The purported principal object of the trip will be to reinforce India’s position that it should not be economically punished for doing business with Russia. The so-called Countering America’s Adversaries Through Sanctions Act (CAATSA), which was passed in August 2017 to punish Russia for reportedly influencing and manipulating the 2016 presidential election process in the United States, came into effect in January 2018. The U.S. law decrees the imposition of mandatory sanctions on countries importing Russian military hardware. Russia has been India’s largest defense supplier since the 1960s and has accounted for 68 percent of New Delhi’s arms imports from 2012 to 2016, according to the Stockholm International Peace Research Institute. As a result, it is unsurprising that India has been seeking a waiver under CAATSA to procure Russian military equipment including, among other things, five regiments of Russian-made S-400 Triumf advanced air defense systems (NATO reporting name: SA-21 Growler). 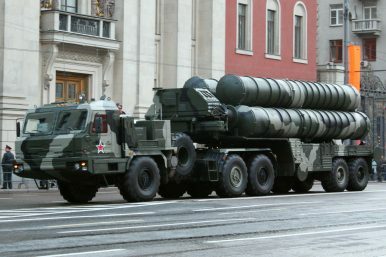 The S-400 procurement has been a particular cause of concern for U.S. defense officials. As India is also interested in acquiring high-tech U.S. weaponry, including advanced fighter jets, the Pentagon is worried that Russia may be able to obtain sensitive computer source codes of various U.S.-made weapons systems delivered to India, which would enable Russia to develop more effective countermeasures against, for example, U.S. aircraft. Notably, the U.S. National Defense Authorization Act (NDAA) grants the Trump administration authority to waive mandatory sanctions under CAATSA in some circumstances when it comes to Russian legacy systems and military hardware that costs less than $15 million. However, given that the total contract value for the five S-400 regiments is estimated at around $5.5 billion and that the S-400 is not legacy hardware — it is considered to be one of the most sophisticated long-range air defense systems in the world — the waiver would technically not apply. U.S. concerns are further amplified by the fact that the signing of the so-called Communications Compatibility and Security Agreement (COMCASA) between India and the United States, following almost 15 years of negotiations, is reportedly imminent. (According to sources, it is likely to take place during the Indo-U.S. two-plus-two ministerial dialogue in the fall.) COMCASA is meant to enable the transfer of advanced secure and encrypted communication systems. COMCASA along with CAATSA is also slated to be discussed during the 17th iteration of Indo-US Military Cooperation Meeting, which was kicked off today, “as a prelude to [the] 2+2 Dialogue between the two countries scheduled next month,” according to the Indian military’s Integrated Defense Staff. Nevertheless, the new CAATSA waiver is still expected to reduce the chances of sanctions. Indeed, the U.S. defense secretary has been vocal about his support for the waiver. “Doing so allows nations to build a closer security relationship with the U.S. as they continue to transition from reliance on Russian military equipment,” Mattis argued in a letter to Congress on July 20. Irrespective of the meeting outcomes, India will likely proceed with the procurement of the S-400 batteries. The contract for the missile defense systems is slated to be signed during a summit meeting between Indian Prime Minister Narendra Modi and Russian President Vladimir Putin scheduled for October 2018.